Jospeh said she visited a store last weekend where she talked to someone inside. Outside she said she was met by an RCMP officer who said he was investigating an alleged theft. She said the police officer wanted to know her name and the name of the person to whom she had been talking. Joseph said the officer eventually got her ID. Smithers RCMP confirm an incident did take place and told CBC News they were called to the scene of a theft in progress. B.C. Civil Liberties Association Policy Director Micheal Vonn said as far as she can tell, there was no legal basis for an arrest. 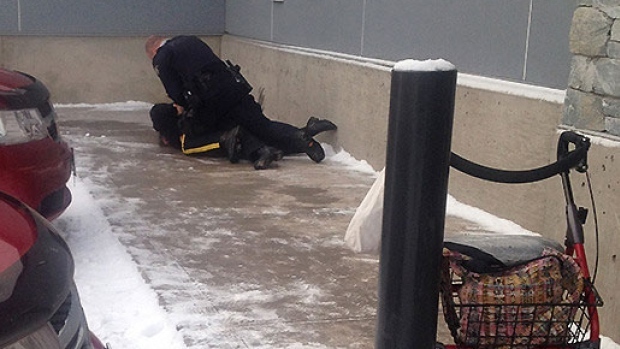 RCMP said no criminal charges have been laid, but its investigation is ongoing. Posted on December 13, 2014, in State Security Forces and tagged Irene Joseph, RCMP, RCMP and Natives, Smithers RCMP, Wet'suwet'en. Bookmark the permalink. Leave a comment.